Bookings for Christmas 2018 are going quickly so you can expect a friendly festive spirit with brightly decorated caravans and motorhomes across the site. Do remember, the owners of the best decorated unit will receive a prize bottle of wine. Then there will be a small gift for everyone staying at the park for Christmas Day or over New Year. In case you have not stayed with us previously, all pitches are large hardstandings with lots of room for your awning. Subdued park lighting is provided by illuminated services bollards. Our 5-star personal facilities are all cosily warm, while wash-up and other facilities are all under cover. Everyone wants to be ‘in-touch’ over Christmas, so you’ll be pleased to know you can access FREE WiFi throughout the park. 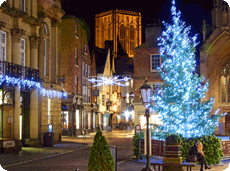 York city centre is just 2 miles from the caravan park so the wonderful Christmas markets, York Minster, museums, theatres, cinemas, restaurants and pubs are conveniently only ten minutes from your pitch. Find details of all that’s going on in and around York in the Christmas period, check out York’s full Christmas Programme here. Christmas at Sandburn Hall, Flaxton, York, YO60 7RB. The Judge’s Lodging Hotel, Lendal Street, York. The Fox Inn. Popular dog friendly Inn, Stockton Forest. Christmas at Hopgove Toby Carvery, within walking distance of the caravan park. The Coastliner bus does not operate on Christmas Day. Otherwise there is a covenenient, frequent service from the park gate operating until late at night. Read the bus timetable here.